These are dangerous times for the U.S. Army, but it would be a tragedy if the increasingly frantic warnings about having a smaller and underfunded force left anyone thinking America’s soldiers are weak or unwilling to fight. It’s true that an Army of less than 1 million Total Force soldiers (active, reserve, and guard) is too small given the expanding demands for deployed and forward-stationed troops, increasing risks to national security as well as the chance of casualties among our ranks. It’s true the consequences of 15 years of war, followed by dramatically constrained budgets, have seriously degraded readiness. Staff Sgt. Conrad Begaye awards then-Spc. 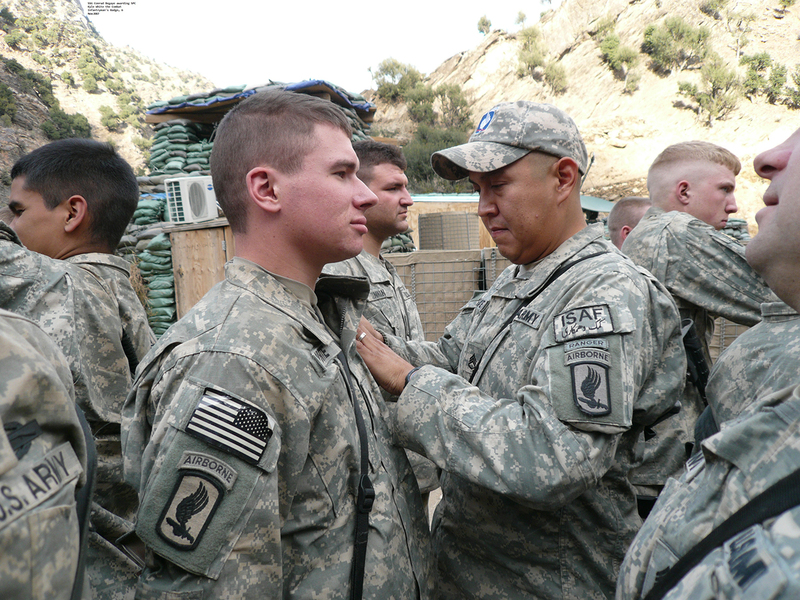 Kyle White the Combat Infantryman Badge during a ceremony in Nuristan Province, Afghanistan, Nov. 6, 2007. Only about one-third of the Army is fully combat ready today, far less than the 70 percent readiness required to meet demands of combatant commanders. It’s also true, as Lt. Gen. H. R. McMaster (see editor’s note below) recently warned Congress, that the Army faces the possibility of being outranged and outgunned in future conflicts because the pace of our weapons modernization has slowed to a trickle. These are worrisome problems demanding immediate attention, but I’m concerned the calls to fix what is ailing the Army might be wrongly received as a message that our soldiers are losing their willingness to fight. America’s soldiers are not quitters. These are not men and women who stay home unless the playing conditions are just right. When they are called upon – and a quick look at the globe makes it clear we are talking about when, and not if – they’ll be in it to win it. Because the Army is full of examples of soldiers who don’t quit. Capt. Florent A. Groberg was presented the Medal of Honor in November for the courage and valor he showed in Afghanistan while heading a security detail in 2012. He put himself between a suicide bomber and the people he was guarding, and he repeatedly pushed the bomber away from the group and onto the ground. The bomb went off, throwing Groberg 20 feet through the air, knocking him unconscious and severely wounding him. When his comrades rushed to his aid, he was on the road with his pistol drawn, ready to continue the mission. Sgt. Kyle J. White received the Medal of Honor for the selfless bravery he displayed in Afghanistan in 2007, when he and his 13-member team were ambushed. Injured and knocked unconscious early in the attack, White regained consciousness to find a situation where the team was pinned down by menacing fire from above, and with several teammates severely wounded. The 20-year-old, who had been in the Army for only 21 months, dragged comrades to safety and provided medical attention. And, he exposed himself to enemy fire again when he took a radio from a fallen soldier to call in airstrikes on enemy positions so survivors could be evacuated. Six members of the team died, but White’s extraordinary, dogged and selfless actions are a display of true soldier grit. It is soldiers we are thinking of when worrying about the undermanned, under-ready and underfunded Army we’ve created by allowing a dysfunctional federal budget process to determine national security posture. We need to correct the mistake we’ve made in letting the budget, rather than real-world realities, decide our best defense. We are also making mistakes that threaten the continued success of the all-volunteer force. We’ve created a situation where soldiers live and work in buildings that are decades behind on maintenance, where they aren’t getting enough training, and where they know they’ll have to wait for much-needed improvements in weapons and equipment. On top of this, many soldiers and their families – as well as members of the other services and their families – question the federal government’s commitment to their well-being and quality of life as a result of an extended attempt to save money by reforming military compensation and benefits such as health care and housing. I’m fully aware that when I raise concerns about the dangerous downward trend I see in the Army, I’m adding to some of the anxiety. I worry the trend line will change only when we face imminent and grave danger. Our current generation of soldiers is made of the same stuff as their ancestors. An inscription on the granite base of a Civil War monument in Sharpsburg, Maryland, marking the single-most lethal day in Army history at the Battle of Antietam, explains what makes soldiers tick. We have time to act. We must acknowledge that by fielding an Army shaped by budget constraints, we create a situation where wars may last longer, and casualties may be higher, because we won’t have the decisive edge that has been part of our nation’s military doctrine since the end of Cold War. Our nation deserves better, and so do our soldiers. I know they will do everything they are asked to do. I fear they will suffer losses they should not.